The Elbe (; Czech: Labe  [ˈlabɛ]; German: Elbe [ˈɛlbə]; Low German: Elv, historically in English also Elve) is one of the major rivers of Central Europe. It rises in the Krkonoše Mountains of the northern Czech Republic before traversing much of Bohemia (Czech Republic), then Germany and flowing into the North Sea at Cuxhaven, 110 km (68 mi) northwest of Hamburg. 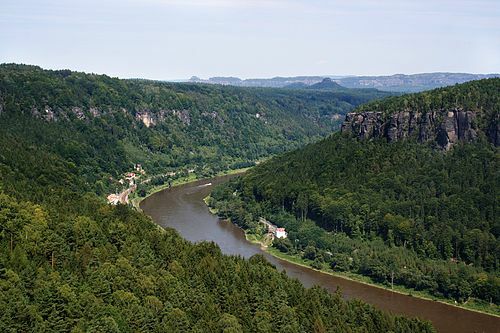 Its total length is 1,094 kilometres (680 mi).The Elbe's major tributaries include the rivers Vltava, Saale, Havel, Mulde, Schwarze Elster, and Ohře.The Elbe river basin, comprising the Elbe and its tributaries, has a catchment area of 148,268 square kilometres (57,247 sq mi), the fourth largest in Europe. The basin spans four countries, with its largest parts in Germany (65.5%) and the Czech Republic (33.7%). Much smaller parts lie in Austria (0.6%) and Poland (0.2%). The basin is inhabited by 24.4 million people.